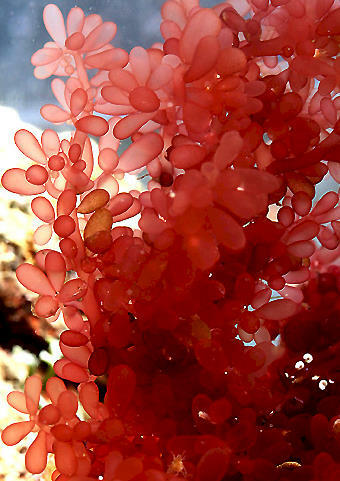 Botryocladia is a beautiful specimen that does very well in the marine aquarium. It features stiff, lightly calcified branches with bright red air bladders. 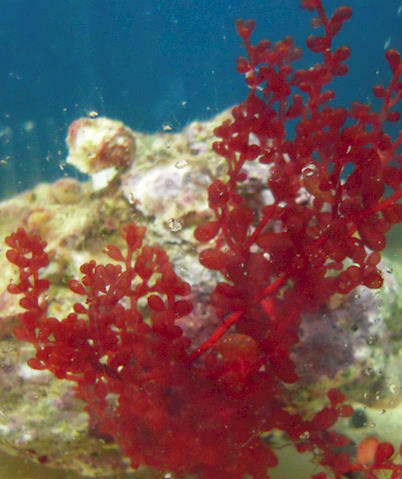 It resembles a cluster of grapes and is sometimes referred to as Red Grape Caulerpa, although it is not a species of Caulerpa at all. Depending on the species, it can grow in rather large clumps attached to rocks and coral fragments in depths of up to 30 feet or more. It is very hardy and seems to do well in aquariums with good water quality and low to medium lighting. There are several varieties available in the aquarium trade, but identification can be difficult as they all have the same basic characteristics.